Cooler air temps and changing leaves are here, so the Fall fishing has begun. The larger wild brown above is also indicative of Fall fishing on the Gunpowder. This brown measured over fifteen inches and didn’t take a big streamer, but instead took a size 20 midge larva on 5X tippet. I fished a few hours in the rain, and the day after the big storm. The browns were aggressive in the mid-river areas (stained water) after the storm, especially on caddis larva and pupa patterns. A variety of brighter nymphs like copper johns, green weenies, and SJWs also produced trout in the off color flows. The recent heavy rains mainly affected water levels in the sections outside the Catch and Release area, so the upper miles of river remained low and clear. In the next few days the clarity in the lower sections of river outside the C & R will improve quickly. The Gunpowder has a lot of feeder creeks, so the farther down river will equate to higher flows. 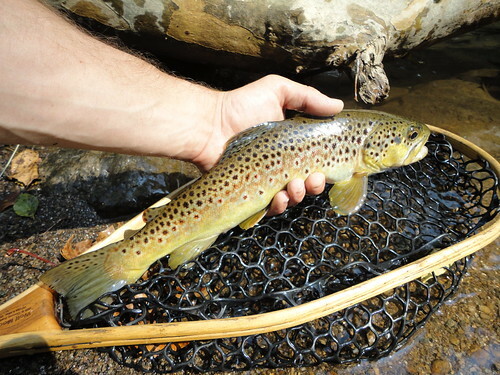 In the upper sections of river tricos, olives and caddis are fooling trout in riffles. Nymphing small flies is also working well in riffles, and deeper pools. The shop received a large midge order, which included a variety of RS2s, WD-40s, and zebra midges. Small flies can be the most effective patterns through the Fall and Winter on the Gunpowder. In the latest video post I filmed a few fish on my first days back on the river. This entry was posted in fishing report, video on October 2, 2010 by Jason du Pont.